RT, before you launch into yet another glorification of the virtues of ignorance, you may like to sit back, engage some neurons, and watch this 10-minute video on climate feedbacks. 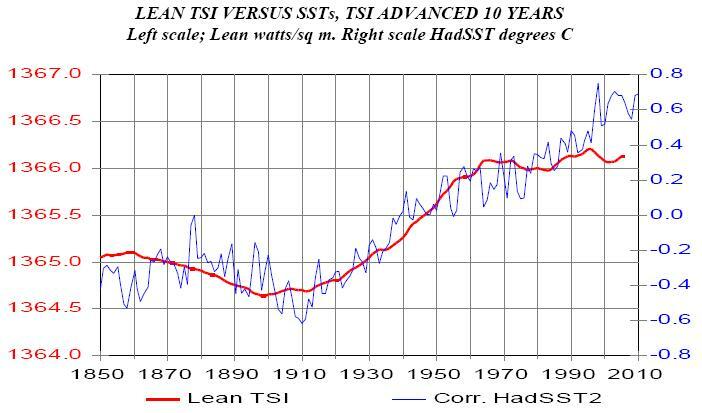 We know about the Arctic ocean ice/albedo feedback that brought about the SIE decline thanks to Dr Maslowski in 2006 Rob, set off by the ’98 El Nino – nothing anthropogenic. Nice pictures. Interesting historical footage, but where was the bit about climate feedbacks? Looks like there was some problem with editing the post, and its gone up twice – the second link is the correct one, but the Svalbard video is good, too. Whatever random concatenation of denialist psuedoscience you “know” today is of little interest to me, RC; save it for your therapist. Since I watched the Svalbard video, here are some comments. There was a coal mine set on fire, left to burn for decades. I am not sure of the relevance of this, except that it is *bad*. Maybe some of the soot from the coal burning resulted in some glacial melt? I thought the opposite was true. There was some moralising about how future generations would see us. We’ve long ago figured out that you have “little interest” in evaluating evidence of climate change cause, natural vs anthropogenic Rob – that’s been self evident. Well your movie shows the theory Rob, but what actual evidence do you have that these positive feedbacks are occurring? So far the theory is failing dismally due to a lack of evidence. There is no tropospheric hot spot to show high level atmospheric water vapour which is needed to prove positive feedback, and low level water vapour more than likely has a negative feedback effect. This lack of upper level water vapour and it’s associated positive feedback mechanism is reflected in the failure of the models to accurately predict the future temperature rises. The movie has lots of ‘ifs’, ‘coulds’, and ‘potential runaway greenhouse’, but lacks any empirical evidence to back it up. The real empirical evidence points to the fact that there is no positive feedback from water vapour, therefore AGW has only a minor effect on the climate. Prove the tropospheric hot spot and maybe people will listen to you, or alternatively, explain how the temperature can rise beyond 1.2C for every doubling of atmospheric CO2 without positive feedback from water vapour. Otherwise the possibility of your movie becoming reality is extremely remote, and there is no scientific evidence whatsoever for catastrophic AGW beyond a mild warming, a warming that is actually more beneficial than harmful. Dr. Steven C. Amstrup, chief scientist with Polar Bears International and USGS polar bear project leader for 30 years. Q: Why all the fuss about polar bears? Aren’t their populations increasing: in fact, booming? One Russian extrapolation presented in 1956 suggested a number of 5,000 to 8,000, but that figure was never accepted by scientists. The fact is that in the 1960s we had no idea how many polar bears there were. Even now, about half of our population estimates are only educated guesses. Back then, the best we had over most of the polar bear’s range were uneducated guesses. Polar bear science has come a long way since then. We do know (and I have published papers on this) that some polar bear populations grew after quotas were imposed in Canada, aerial hunting ceased in Alaska, and trapping and hunting were banned in Svalbard. All of these events occurred in the late 60s or early 70s, and we know some populations responded—as you would expect. Some populations were not being hunted back then (or were hunted very little) and those were probably unaffected by these three actions. Back then, the sea ice was solid and not noticeably in retreat. With stable habitat, polar bears were a renewable resource that could be harvested on a sustainable basis. But the most important point is that whatever happened in the past is really irrelevant. Polar bear habitat is disappearing due to global warming. Even the most careful on-the-ground management doesn’t matter if polar bears don’t have the required habitat. Polar bears depend on the sea ice surface for catching their prey. A shorter duration of ice cover over their productive hunting areas means less opportunity to hunt. A reduction in sea ice has been statistically linked to reduced stature and weight in polar bears and to lower survival rates of cubs. So, it doesn’t really matter that hunting is now largely under control or that we know a lot about other impacts people might have on bears. Without habitat, polar bears will disappear no matter what else we do. If a farmer has 100 cows out in a pasture, and every year he goes out and paves over some of his pasture, pretty soon he won’t have enough habitat to support 100 cows. And, each time he paves over a little more land, his remaining land will hold fewer cattle. There may be some short-term enhancements of the remaining habitat that will forestall the inevitable. But, when his whole pasture is paved there will be no cows! Declining habitat now and the assurance it will decline in the future is why polar bears were listed as a threatened species. Discussions about how many bears may have lived in the past before and after hunting quotas have no bearing on this new situation. Planetary physics require the world to warm as greenhouse gas concentrations rise, so without greenhouse gas mitigation, the ice will continue to melt. For an animal dependent on sea ice to survive, the prospects are not good. As the ice decline continues, the plight of the polar bear only can worsen. Magoo, it is truly risible that you claim to be the arbiter of what scientific evidence is, or is not available, yet can only quote a journalist to support your claims. Do you have any scientific training yourself, or are you just a gullible parrot? What scientific research can you provide to back up your extraordinary claims? But the most important point is that whatever happened in the past is really irrelevant. Polar bear habitat is disappearing due to global warming. So just to be clear here, even though Polar Bear populations are not on the decline, this is “irrelevant” because what happened in the past is irrelevant. Therefore we can say Polar Bear populations are declining by extrapolation out to a hypothetical period in the future when Polar Bear populations are actually declining. The future is relevant, the past is irrelevant, even though we know quite a lot about the past and very little about the future. Hmm, the Minoan, Roman and Medieval Warm Periods were all warmer than now, and for longer, yet we still have polar bears with us. Of course, all that happened in the past, so it’s irrelevant. So, does the “hot spot” actually exist? That is to say, is the tropsosphere (sic) actually warming as expected? Unfortunately, the answer to this is much less cut and dry. …things are behaving more or less as we’d expect. Actually Rob, the hot spot graph is from the US Climate Change Science Program’s Synthesis & Assessment Report 1.1 2006, chapter 5, page 116. 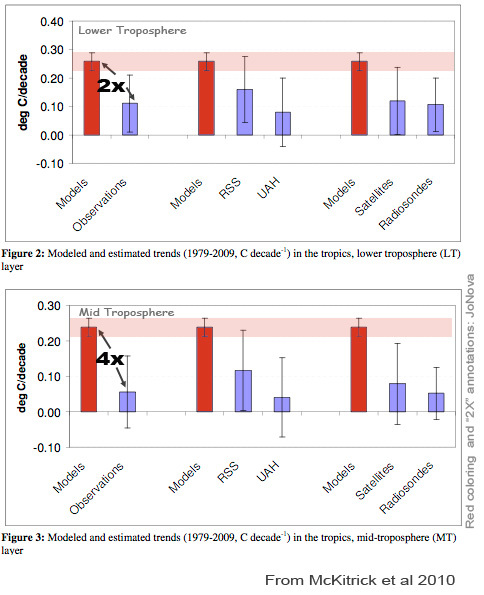 The graphs of the models are from McKitrick, Ross R., Stephen McIntyre and Chad Herman (2010) “Panel and Multivariate Methods for Tests of Trend Equivalence in Climate Data Series” in press at Atmospheric Science Letters. Yet to be debunked as far as I know. Those two papers back up my claims. I don’t know why you’re mentioning a journalist for, the fact that Jo Nova mentions them on her website doesn’t mean she wrote them. I’m well aware of skepticalscience’s articles on the matter. I also notice that he never mentions the peer-reviewed papers that debunk every one of his papers on the issue, I’ve always wondered why. What Cook is doing is sidetracking the issue into a warming upper troposphere/cooling stratosphere issue which is beside the point – it’s much simpler than that. The tropospheric hotspot should be proof of positive feedback from atmospheric water vapour, regardless of the ‘fingerprint’ argument. The tropospheric hot spot does not exist therefore evidence of positive feedback from atmospheric water vapour doesn’t exist either. Since you insist on scientific research I assume you can provide some to backup your claims of positive feedback from water vapour. Avoid the papers John Cook at skepticalscience uses on the matter though, they’re all debunked (he should really mention that to his readers). One other thing Rob, there’s no need to get nasty or rude about it, I’m just the messenger. If you have a problem with the empirical data or those who supply it in peer reviewed articles then I suggest you take it up with them. It’s hardly my fault the water vapour feedback theory has no evidence to back it up. The atmosphere above 400 hPa (the “hotspot” zone) is not storing warmth. Magoo, you’re a pleasure to read – clarity and restraint exemplified. Thanks. I find it amusing that AGW deniers usually dismiss climate modelling out of hand, EXCEPT for that reported in AR4 that indicated a tropospheric hot spot, which they seize upon with squeals of glee, claiming it to be the “smoking gun” that somehow invalidates 150 years of scientific observation and experiment. Which it is does not. 1) Greenhouse gases absorb infrared radiation in the atmosphere and re-emit much of it back toward the surface, thus warming the planet (less heat escapes; Fourier, 1824). So, guys, where is the research that contradicts these 19th century results? I’m happy to wait…. The main problem I have with this Polar Bear argument is that there are around 20,000 bears alive. Their habitat is spread around the very large area we know as “The Arctic” which includes parts of Canada, Russia, Norway etc. So Rob, which among those 19th-century papers conducts their experiments on the earth’s atmosphere as a whole? You did claim “150 years of scientific observation and experiment”, didn’t you? So where is the observational evidence? And why did you exclude Arrhenius (1906), by the way? It updates 1896. I note the quick move on your part to try to divert attention away from the lack of the hot-spot. And it’s not “deniers” who predicted the existence of the hot-spot, Rob, it was the IPCC. Are you wanting to cherry-pick which IPCC predictions you’d like to examine, based purely on their actual outcome? Nobody disputes your points 1 to 4 Rob, but where is proof of the water vapour feedback? The temperature can only rise 1.2C (maximum) per doubling of total atmospheric CO2 (not just man’s). The current total atmospheric levels are somewhere around 397 parts per million (ppm) from memory, & to raise the temp by 1.2C the levels will need to rise to 794ppm. After this, for it to rise another 1.2C it will need to rise to 1588ppm, etc. CO2 has a diminishing ability to absorb infra red as it’s concentrations rise, and is a weak greenhouse gas as a result. The majority of warming is supposed to be through positive feedbacks which are supposed to amplify the warming by a factor of approximately 3 times, most of which is supposed to be due to water vapour which is a strong greenhouse gas. It doesn’t matter what the cause of the hot spot is, whether it is natural, man’s fault, a volcano, or whatever, the fact that it doesn’t exist means there is no evidence of positive feedback from water vapour. Without the water vapour positive feedback there is no AGW. You need to show the tropospheric hot spot or evidence of positive water vapour feedback for AGW to be valid, otherwise it’s so small that it’s barely noticeable. That’s why McKitrick et al’s graph below shows the failure of the models. The warming of the CO2 isn’t being amplified by water vapour positive feedback, something that is reinforced by the failure of 2 satellites and millions of radiosondes to find the hotspot. And even if the IPCC curve is assumed to be valid, there’s no corroboration from observed DLR. I do Magoo. Remember that the debate spectrum is (as I see it), Warmist (CO2 forcing + positive feedback on temperature) – Lukewarmer (CO2 forcing, indeterminant feedback on temperature) – Heretic (negligible CO2 forcing, negative feedback on temperature). I’m firmly in the heretic camp and I find the lukewarmer stance more closely aligned with warmists than heretics. The 19th century endeavours that Rob cites in 1 to 4 have no bearing on present day radiative heat transfer physics. In terms of CO2, that has been developed by Hottell and Leckner from which we know (or should) that CO2 forcing is all but exhausted by about 200 ppm. By applying generally accepted algorithms on radiative heat transfer, verified through experimentation by Hottel(1), Leckner(2) and other contemporary scientists and engineers(3)(4)(5), I have found that carbon dioxide molecules posses a low total emissivity at the current density of CO2 in the atmosphere. Cp = 871 J/Kg K at 1 atm and 308 K.
I think Nasif has an error on page 11, “ca. 4 K” should be ca [0. ]4 K or 0.33 K (by eye), so that the reduction is from 35 K to 34.57 K – not 35 to 31. CO2 is a refrigerant and is making a comeback in refrigeration, hence (quoting Nahle) “the conclusion is that carbon dioxide operates like a coolant in the atmosphere” and the graph on page 12. Too bad, RC, even your own “side” aren’t interested in your raves – you need to either publish, or shut up. Once again Rob doesn’t answer any questions or engage in intelligent conversation, but merely insults people, and tries to divert attention away from the missing hot-spot. At last, a clear exposition of a valid point; thankyou, Mr. Magoo, perhaps you’d like to visit Hot Topic sometime? As I’m sure you know, a low climate sensitivity disposes of the MWP; I’d be interested in your views on that as well. 1. Hottel, H. C. Radiant Heat Transmission-3rd Edition. 1954. McGraw-Hill, NY. 2. Leckner, B. The Spectral and Total Emissivity of Water Vapor and Carbon Dioxide. Combustion and Flame. Volume 17; Issue 1; August 1971, Pages 37-44. 3. Manrique, José Ángel V. Transferencia de Calor. 2002. Oxford University Press. England. 4. Modest, Michael F. Radiative Heat Transfer-Second Edition. 2003. Elsevier Science, USA and Academic Press, UK. 5. Pitts, Donald and Sissom, Leighton. Heat Transfer. 1998. McGraw-Hill, NY. 6. Chilingar; G. V., Khilyuk, L. F.; Sorokhtin, O. G. Cooling of Atmosphere Due to CO2 Emission. Energy Sources, Part A: Recovery, Utilization, and Environmental Effects; Volume 30, Issue: 1 January 2008; pages 1 – 9. You just have to look Rob. No I don’t “need” to publish. There’s already a body of publications (that you’re denying Rob) and it’s just a matter of applying that work to atmospheric conditions. Climate science makes no recourse to that body of established science, needless to say the IPCC have led govts around the world on a merry dance that’s distorting economics based on fallacy. I’m guessing Gareth Renowden is oblivious to those publications since he subscribes to the “160 years of science” (his words) that you’ve presented (except for anything from 1954 onwards). You might like to alert him Rob – then he can deny them too. I didn’t know. Does that work without circular reasoning that CO2 is a major driver of climate? Climate sensitivity to CO2 is 0 this century according to the IPCC CO2 forcing expression. CO2 may not be a forcing of course. Me, I think it’s natural variability doing the forcing. Have you actually read any of these references Richard? If so perhaps you would consider sharing the relevant parts. An adequate treatment of thermal radiation heat transfer is essential to a mathematical model of the combustion process or to a design of a combustion system. This paper reviews the fundamentals of radiation heat transfer and some recent progress in its modeling in combustion systems. Topics covered include radiative properties of combustion products and their modeling and methods of solving the radiative transfer equations. Examples of sample combustion systems in which radiation has been accounted for in the analysis are presented. In several technologically important, practical combustion systems coupling of radiation to other modes of heat transfer is discussed. Research needs are identified and potentially promising research topics are also suggested. 4. BLOKH, A. G., Heat TransJer in Steam Boiler Furnaces, Energoatomizdat, Leningrad (1984) (in Russian) (to be published by Hemisphere Publishing Corp., Washington, D.C.). 64. SAROFIM, A. F. and HOTTEL, H. C., Heat Transfer– 1978, Vol. 6, pp. 199-217, Hemisphere Publishing Corp., Washington, D.C. 11978). “The expressions for the total emissivity and absorptivity of a gas in terms of the weighted sum of gray gases are useful especially for the zonal method of analysis of radiative transfer. 50. STEWARD, F R. and KOCAEFE, Y. S., Heat TronsJer– 1986, C. L. Tien, V. P. Carey, and J. K. Ferrell (Eds), Vol. 2, pp. 735-740, Hemisphere Publishing Corp.,Washington, D.C. (1986). 51. TAYLOR, P. B. and FOSTER, P. J., Int. J. Heat Mass TransJer 17, 1591 11974). 53. FARAG, I. H., Heat Transfer 1982, U. Grigull, E. Hahne, K. Stephan and J. Straub (Eds), VoL 2. pp. 489-492. Hemisphere, Washington, D.C. (1982). 54. COPALLE, A. and VERVlSCH, P., Combust. Flame 49. 101 11983). That’s in addition to the 8 that you’ve asked if I’ve read and no I haven’t read any of these either. Now Nick, don’t you think it would have been a good idea for the IPCC to have reviewed “the fundamentals of radiation heat transfer” and made “an in-depth review of the world literature on the thermal radiation properties of gaseous combustion products (H20, CO2, …. )” and kept pace with developments over successive years – 1990 onwards – so that their assessment reports would have a basis in state-of-the-art radiative heat transfer science? Note that the Leckner and Modak models are simplifications but that the IPCC curve is in effect, a simplification of a simplification. But the NCAR CAM model for example has a ramping facility (you’ll have to follow your nose through the NCAR CAM links above to the manuals) and I presume others do to. Basically they have a sliding scale to “ramp” up or down in their parameter settings. I’m wondering if the one CMIP5 group that has managed to mimic 21st century absolute temperature and trajectory has ramped GHGs down to 0 i.e. effectively negating the RCP scenarios and relying on the veracity of their RTM. Samoht doesn’t deign to grace us with his presence here anymore – I’m sad. But if he does, I have a long memory. so I’d hardly expect a polite thread. Hi Rob. The reason I avoided Richard C’s points was due to the fact that you’d use them to avoid confronting the water vapour positive feedback issue. I’m sure Richard might very well be right, but it’s a distraction from the real issue of AGW theory failing without the water vapour amplification. The issue is nothing other than what evidence there is for positive feedback from water vapour. Why is this the only relevant issue? Because without it there is no AGW. You can’t claim AGW without addressing this problem because it’s the major part of the AGW theory – CO2 is just the minor contributor. As for Hot Topic, I prefer discussions with manners thank you. It’s the “profiles” for CO2 that are critical – how are they derived, what are they, and how are they applied? In order to reduce the complexity of the climate system enough that it can be simulated on a computer, global climate models divide the Earth into a three-dimensional grid scheme and iterate numeric calculations over each grid cell (Ananthaswamy 2011). The input variables in the system are sorted into two categories: parameters and forcings. c. Tables of Latitudinal Average Responses [page 47 – 48]. EdGCM obviously doesn’t conform to dF = 5.35 ln(C/Co) because CS (λ) is reducing from 2.14 as concentration approaches 2xCO2 rather than increasing towards 5.18. This divergence and non-conformance will be similar in Model E I suspect. From this we can deduce that Model E would probably yield a 2011 temperature of about 0.35 C above 2000 levels on average ignoring other forcings (as GISS implies is possible above). This hasn’t happened therefore the GISS model rationale is flawed beginning with the equations that convert CO2 concentration to forcing. 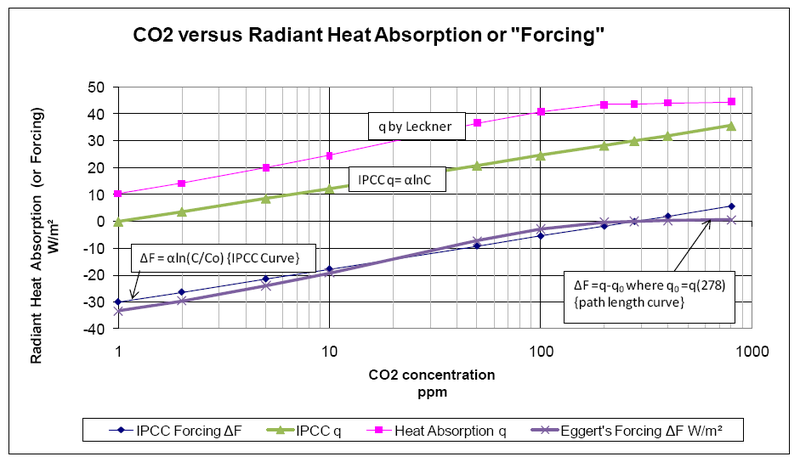 From 2000 to 2011 the Model E “underlying equations” yield, on average, an effective CO2-to-temperature forcing factor of 0.016 (0.35/22 but for 2011 only). This factor, although not constant, represents the “ramping” in the model (I think) and the variation of the factor is due to “steps” (I think). If that ramping were set to 0 for period 2000 – 2011, the model would probably mimic the 0C rise. Any steps in that period would have to be set to 0 too. But then the CO2 spin-up data to 2000 would have to be replaced with an appropriate forcing too. What would that be I wonder? Yes, Magoo, I understood the issue that you raised, and have provided two links that review the evidence for climate feedbacks that act to constrain the lower bound for climate sensitivity to at least 1.5 C for a doubling of CO2. Of course, we need to distinguish between the fast-feedback sensitivity and the long-term “Earth-system” sensitivity, which paleoclimate studies show is higher than the short-term value. From that paleo evidence, we do indeed appear to be heading toward an ice-free world unless we can draw down atmospheric CO2 before the feedbacks become self-sustaining (if they are not already). So, what do you now think of the evidence for positive feedbacks? I do not see any support there for the common denialist position that net positive feedbacks are negligible! The SkS link that Rob provides has a link to Forster and Gregory (2006) which is broken (404). Thus the integrated assessment model (PAGE09 IAM) is distorted from the outset. Thanks for this BH link Andy, I hadn’t caught up with this. Cook’s trying to say that it has to be positive feedback from water vapour otherwise we’d still be in the ice age. Empirical evidence proves him wrong in the current circumstances due to a missing hot spot – it isn’t water vapour feedback and the science proves it conclusively. An assumption has been made and it’s been proven wrong, otherwise you’d have to ignore the empirical evidence of 2 satellites, over 30,000,000 radiosondes, and the temperature records that reflect their findings, in preference of baseless speculation for a theory that doesn’t fit the observed reality. Rob, what you’ve given is theory as to what they think the feedbacks should be and why they think it should be that way. In the case of water vapour there is no evidence whatsoever to back up their theory which is why it is wrong. A weak response, Magoo – you merely repeat your original claim, which shows you have either not read, or not understood, the scientific evidence for a lower bound to climate sensitivity. Which, I guess, explains why you prefer this intellectual backwater, where “truthiness” reigns supreme. This is a very typical response from Rob. He himself doesn’t understand his own scientific claims, merely parroting John Cook (a cartoonist) and Real Climate (an activist site). How about you discuss the actual science, Rob, as laid out in real scientific papers? That is what everybody else is doing, or hadn’t you noticed? Meanwhile, I suspect you’ve both seen the latest attack against his Yamal work by McIntyre. Gavin and I (having consulted also w/ Malcolm) are wondering what to make of this, and what sort of response—if any—is necessary and appropriate. 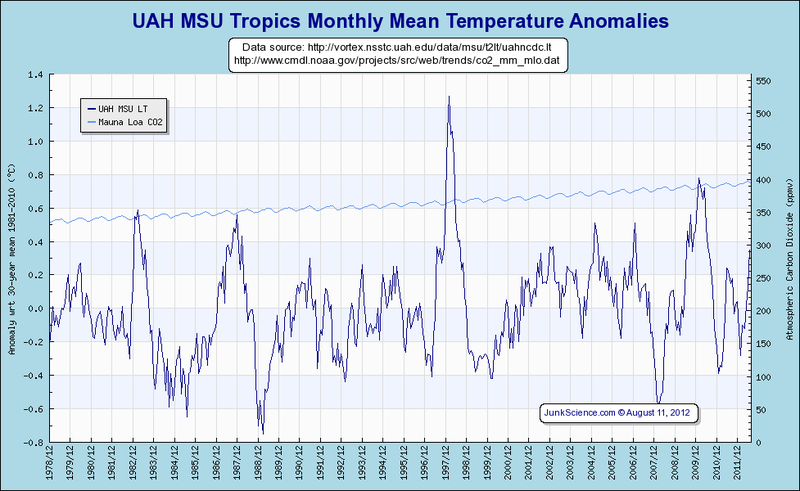 So far, we’ve simply deleted all of the attempts by McIntyre and his minions to draw attention to this at RealClimate. So when they can’t answer the questions, they delete the questions. As a matter of fact, Bob, no, I had not noticed any such thing. I do see, however, frequent recourse to the hoary old catechisms of the Church of Denial, such as the “missing hot spot disproves AGW” and the “Arctic ice loss was caused by a storm”. Strangely – given the spirit of scientific enquiry that you say pervades this site – none of you seem interested in what powered that storm, which is the same thing that is causing the ice to melt – warmer sea water in the Arctic. The temperatures of North Atlantic Ocean water flowing north into the Arctic Ocean adjacent to Greenland — the warmest water in at least 2,000 years — are likely related to the amplification of global warming in the Arctic, says a new international study involving the University of Colorado Boulder. The study showed that water from the Fram Strait that runs between Greenland and Svalbard — an archipelago constituting the northernmost part of Norway — has warmed roughly 3.5 degrees Fahrenheit in the past century. The Fram Strait water temperatures today are about 2.5 degrees F warmer than during the Medieval Warm Period, which heated the North Atlantic from roughly 900 to 1300 and affected the climate in Northern Europe and northern North America. The team believes that the rapid warming of the Arctic and recent decrease in Arctic sea ice extent are tied to the enhanced heat transfer from the North Atlantic Ocean, said Spielhagen. According to CU-Boulder’s National Snow and Ice Data Center, the total loss of Arctic sea ice extent from 1979 to 2009 was an area larger than the state of Alaska, and some scientists there believe the Arctic will become ice-free during the summers within the next several decades. Since continuous meteorological and oceanographic data for the Fram Strait reach back only 150 years, the team drilled ocean sediment cores dating back 2,000 years to determine past water temperatures. The researchers used microscopic, shelled protozoan organisms called foraminifera — which prefer specific water temperatures at depths of roughly 150 to 650 feet — as tiny thermometers. In addition, the team used a second, independent method that involved analyzing the chemical composition of the foraminifera shells to reconstruct past water temperatures in the Fram Strait, said Marchitto. The rate of Arctic sea ice decline appears to be accelerating due to positive feedbacks between the ice, the Arctic Ocean and the atmosphere, Marchitto said. As Arctic temperatures rise, summer ice cover declines, more solar heat is absorbed by the ocean and additional ice melts. Warmer water may delay freezing in the fall, leading to thinner ice cover in winter and spring, making the sea ice more vulnerable to melting during the next summer. Air temperatures in Greenland have risen roughly 7 degrees F in the past several decades, thought to be due primarily to an increase in Earth’s greenhouse gases, according to CU-Boulder scientists. But you can help me with one thing, Bob; has NZCSET paid NIWA’s $100 K + legal costs yet? Or will you be hiding behind the skirts of your “charitable status”? Ok Rob. No evidence for positive feedback from water vapour? Nobody else has been able to do so either so it was no surprise. No hot spot = no evidence of positive feedback from water vapour = no AGW (no cause therefore no effect). Avoiding the issue by substituting the broader subject of climate sensitivity in the place of evidence for WV positive feedback shows that you have no evidence. How can people believe in AGW theory when there’s no evidence for the biggest part of it? That is why those who believe in AGW avoid this issue like the plague. I won’t be back for a while as I have two major papers that I need to complete and will be too busy. In the meantime perhaps you’d like to consider the issue of what evidence there is for water vapour positive feedback alone, and why the broader subject of theoretical climate sensitivity is not a viable substitute for the issue. Find evidence of the hot spot or water vapour positive feedback – without them all the articles in the world on climate sensitivity are nothing but speculative guesses, as are the corresponding failed climate models. So we see waters in the Arctic have risen over the last 150 years. This is no surprise to anyone, since this has been measured everywhere due to the recovery from the LIA. However, nowhere is any observational evidence submitted that Arctic storms have been growing stronger as a result. It is also unlikely to be unprecedented if true, as we know the Arctic was as warm in the 1930/40s (Howat 2007), and also in the MWP, the RWP and the Minoan WP. But you can help me with one thing, Bob; has NZCSET paid NIWA’s $100 K + legal costs yet? I don’t know. You’ll have to ask them. And where did the NA Ocean heat originate? No-one can make correlations anywhere like the above using CO2 concentration AND the anthropogenic component of DLR Rob. And before you can even START talking about causation mechanisms, you must have the correlations. You (of AGW) don’t have those correlations Rob, we (of natural cycles) do. What new advance of any import was made by Spielhagen et al and reported in 2011 that the work of Karcher et al in 2003 had not already provided? BS, Magoo; climate sensitivity parametrises net forcing, including feedbacks, and is constrained by several independent lines of evidence, which I have provided references to. Rather than deal with those, you seek refuge in the short-term noise in the system, ignoring the increasingly clear long-term signal, then do a runner… most impressive! As for Bob’s invocation of the LIA, what, pray, is the net forcing behind the “rebound”? Or does it just, like, um, you know, kinda happen, man…? A 1.25 W/m2 increase in solar activity (including 50% rise in UV) since the Maunder minimum (IPCC 0.12 W/m2). —– the Maunder minimum was in the 17th century!